Periodontics is the treatment of the gums and the periodontium (paradontosis). The key to treatment of paradontosis is correct diagnosis and the exact analysis of the alveola of each tooth. Periodontics – what are the symptoms of gum disease? Periodontics – what is the basic treatment? fluoridation of the teeth – sealing all surfaces of all teeth with a special preparation protecting them from hypersensitivity which can occur after treatment. Full oral cavity hygiene should be done on a regular basis, every 6 months, and among patients with a tendency to deposits of dental plaque even as often as every 3 months. 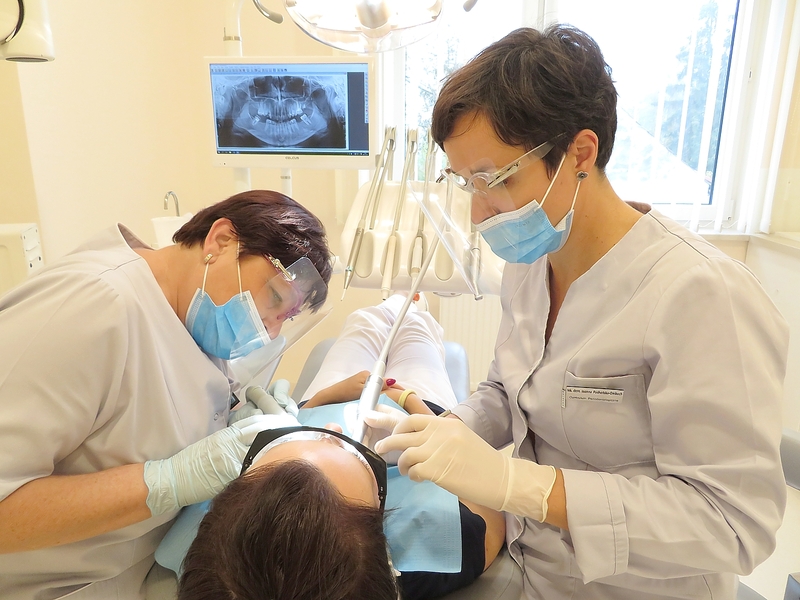 Periodontics – what additional treatments are available? surgical lengthening of the clinical crowns of the teeth. Periodontics – what are tooth deposits? Tartar is a gummy dental deposit that grows from the moment of teething. It sticks not only to tooth surfaces but also to the surfaces of fillings and various orthodontic and prosthetic devices (crowns, bridges, and removable prostheses). The so called acquired tooth coat occurs within several seconds after brushing. On one hand the substances it contains protect enamel (the most outer layer of tooth) against caries, on the other however it thickens rather quickly. After 12-24 hours bacteria accumulated in the acquired tooth coat start building up plaque. After 10-14 days the early plaque becomes mature. It can be located above gums (the so called supragingival plaque) and/or under gums (the so called subgingival plaque). After 2-3 weeks plaque causes tooth micro-injuries and porosity, and gingivitis around tooth crowns. At this stage gingivitis is still reversible and disappears several days after thorough removal of plaque. Deposits are very anaesthetic. They occur often in narrow interdental spaces, especially between front lower teeth. Coffee and tea deposits in the form of brown and grey coating are exceptionally durable. Pitch-black deposits of tar substances in smokers are ugly and particularly strongly adhering. Hardly-soluble minerals start accumulating in plaque after 2-3 days of its build-up. They gradually build up even harder yellow or brownish tartar. The process of transformation of plaque into tartar takes approx. 2 weeks, depending on the patient’s individual susceptibility and composition of saliva. Bad oral hygiene additionally enhances tartar. The thicker the dental deposit the more intensive the calcification process and tartar build-up. The extremely porous surface of tartar becomes ground for further clusters of bacteria, which results in the build-up of further layers of plaque. Tartar is more or less just as hard as boiler scale and it adheres to the teeth just as strongly as scale to the boiler. Most tartar builds up around salivary gland openings: on the internal (glossal) surface of lower front teeth and on the external (buccal) surface of upper molar teeth. Subgingival tartar is particularly dangerous as it intrudes inside the gum (the so called gingival sockets) along the root like an iceberg, thus destroying the bone and the special structures that keep the tooth in the tooth socket. This results in growing looseness and finally loss of the tooth. Toothache occurs at various times and in various circumstances, both the acute one and the chronic one that drags on over weeks or months. In 90% cases it is caused by pulp problems. Pulp is the inner most part of the tooth that consists of nerves and blood vessels. It occupies the inner space of the tooth which can be compared to a cave with numerous side tunnels that make up a complicated maze: there is the so called main chamber in the tooth crown and a varying number of root canals located in the root. Most often toothache is a symptom of pulp infection with bacteria. Pulp infection gradually leads to its death and bacteria quickly penetrate into all recesses of the space it takes. Unless adequate treatment is initiated at this stage, the products of bacteria and nerve decomposition in the pulp migrate through the root to the bone and cause inflammation there.